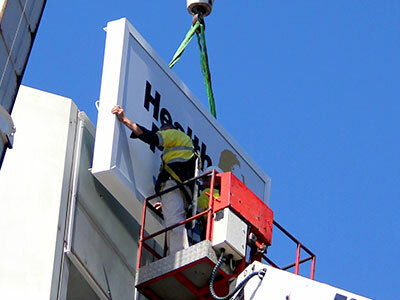 Image Install is a dedicated team of signage professionals specialising in signage installation projects. By default we also have become a turnkey signage solution servicing the signage industry offering project management in house manufacturing, installation and maintenance. With over 25 years of signage experience, there isn’t a signage project we haven’t tackled before. All of our team are trade qualified in either signwriting or a building trade, White card inducted, licensed for EWP & Work Zone Traffic Management. The benefits of using Image Install as your preferred signage installer are extensive. With skilled tradesmen experienced in all facets of signage, installation and general building and over 25 years of signage experience, we have managed many major projects throughout South Australia. We can perform any project, ranging from small installations to corporate reimaging programs. At Image Install we guarantee to complete your project on time and to the highest quality with personal attention to detail. While we are on site, we are a representative of your business, and emulate your image. We understand the importance of your reputation. We have many South Australian and national clients who are very happy with our service. Image Install is based in Adelaide, South Australia, however we do many country installation projects. We also manage interstate installation projects.